A morning in Hilo to visit the local Farmer’s Market and Old Town, Hilo Guitars and Ukuleles, the Tsunami Museum, and the annual Exposition put on by the ‘Ukulele Guild of Hawai’i, where you will see some ‘ukuleles that will knock your socks off! A visit to Kaimu Beach to learn about the cultural, geological, and historical significance of volcanoes in this part of the world, play our ukes on the beach, and get an ice cream cone at the Kalapana Cafe. An workshop at luthier Chuck Moore’s amazing studio, where you will see how a master in the art builds some of the most prized ‘ukuleles in the world. And an evening at Uncle Roberts’ Awa Bar at Kalapana, “where the lava meets the road,” for an authentic, down home, Hawaiian-style, musical experience. And the fun won’t end there. 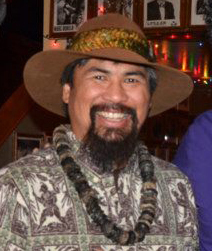 In addition to the All Camp Jams and the Battle of the Bands we’ve become famous (or infamous) for, multiple Grammy Award winner, Keoki Kahumoku will visit one evening to”talk story,” play and sing for us, and lead us in a jam session, all focused on the music and lore of Hawai’i Island. And he’ll return later in the week with some of the brightest ‘ukulele talent on Hawai’i Island for a “Community Concert” in Kalani’s eMax Room. Your retreat registration includes your accommodations at Kalani, three meals a day, and up to five ‘ukulele workshops each day. And while we still have lodge rooms, two tropical lofts, and one tree-house room available, we will be releasing those back to Kalani in about 10 days. After that, you may or may not be able to get a room there. So, if you are planning on joining us, please get your registration in to us as soon as possible. We know you won’t regret it. ~ by UkuleleLady on August 15, 2013.